And then there was Schiller and Gore. 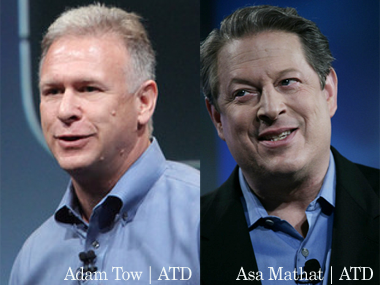 That would be Apple’s SVP of worldwide product marketing Phil Schiller and former Vice President Al Gore, who round out the stellar list of speakers at our upcoming AsiaD conference. Taking place from Oct. 19 to 21 in Hong Kong, the lineup is already impressive, with a mix of speakers from China, Japan, Korea and Taiwan, as well as Silicon Valley and elsewhere. The previously announced speakers include: Alibaba Group’s Jack Ma; Google Android head Andy Rubin; Twitter inventor and product guru, as well as Square co-founder and CEO, Jack Dorsey; Nvidia founder and CEO Jen-Hsun Huang; Asus Chairman Jonney Shih; Sony president and second-in-command Kazuo “Kaz” Hirai; Google+ guru Bradley Horowitz; Hollywood big shot Peter Chernin; Huawei’s North American R&D head John Roese; Microsoft’s Windows Phone head Andy Lees; and a panel of Silicon Valley start-up stars — Joyus’ Sukhinder Singh Cassidy, SurveyMonkey’s Dave Goldberg and Airbnb’s Brian Chesky; Yahoo co-founder Jerry Yang and Asia head Rose Tsou; LivingSocial’s Tim O’Shaughnessy, along with founders of two of its Asian units, Daniel Shin and Paul Srivorakul; Samsung mobile head Dr. Won-Pyo Hong; HTC CEO Peter Chou, who replaces Chairwoman Cher Wang. Schiller, who reports to Apple’s CEO Tim Cook (and before that, Steve Jobs) is a member of the executive team of the tech icon, where he has worked for 17 years. He is responsible for a swath of Apple’s outward-facing businesses, including product marketing, developer relations and business marketing. Today, in fact, he was onstage at Apple’s iPhone event, outlining some of its new product offerings. In addition, Apple just opened its first retail store in Hong Kong. Gore, who had a memorable interview at the fourth D: All Things Digital conference in 2006, needs little introduction. The former VP and Nobel Peace Prize winner is now chairman of Current TV and also continues as a prominent environmental activist. Gore is on the board of Apple, while also being a senior adviser to Google, which is a neat trick. At the same time, he is a partner in the famed Silicon Valley venture capital firm, Kleiner Perkins, and co-founder and chairman of Generation Investment Management, a partnership that is focused on sustainable investing. And, as most people know, he knows a thing or two about the Internet. Walt Mossberg and I could not think of two better people to add to the lineup we have for AsiaD, which has very few seats left. See you in China in two weeks! The Oxford English Dictionary accepts both pronunciations. They are wrong. It is a soft ‘G,’ pronounced ‘jif.’ End of story. — Steve Wilhite, the inventor of the GIF, on its pronunciation. Wilhite was the recipient of a lifetime achievement award at the Webbys.